Interior Decorating by Sophie: Expert tips for deciding between Leather or Fabric sofa? Expert tips for deciding between Leather or Fabric sofa? I’ve been invited to write my thoughts as an interior designer on weighing the options between leather and fabric sofas, so here are some things to consider before making a decision. With an almost inexhaustible range of fabrics to select from, allowing you to express your personality through fibre (linen, cotton, silk, polyester, viscose etc. ), texture, weave, pattern/print and so on; selecting fabric for an upholstered sofa can be intimidating, but also extremely effective in creating a feeling or mood to a room. As technologies improve expanding ranges of fabrics are chemically treated to make them resistant to spills and stains. This is done early in the process by the fibres being chemically treated prior to the thread and cloth being created, rather than the fabric being treated following manufacture. 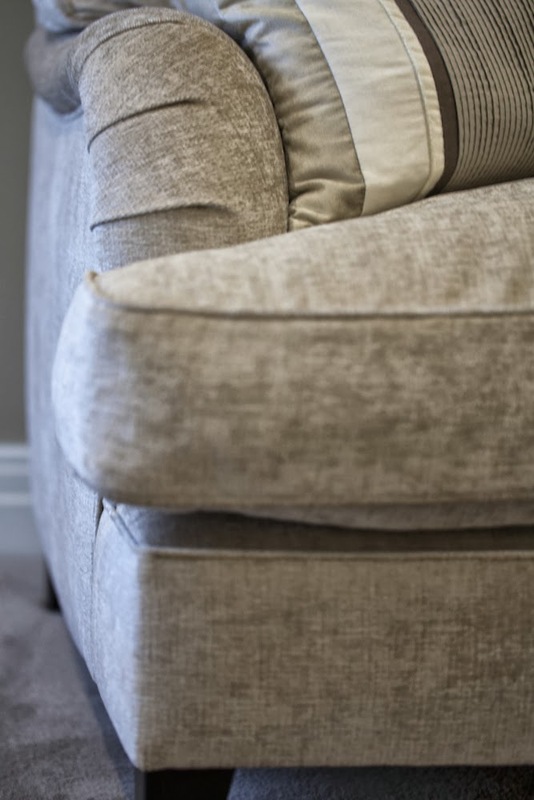 I think it’s fair to say as a good guide fabric will not be as long wearing as leather; it can fade, threads can pull, it can simply wear through and oils from your skin can discolour the upholstery. Of course, you can have your fabric sofa cleaned and regular vacuuming is recommended by all fabric suppliers. Choosing the correct fabric for the application can result in a happy outcome for many, many years; for example a velvet sofa is extremely durable and has an elegant lustre and is called a classic for a reason! When making your fabric selection, think through the results the fabric has from rub tests such as Martindale (I would consider a rating of 12,000 a bare minimum for light upholstery, 20-25,000 for general domestic, and 40,000+ for commercial/heavy wearing) or alternatively Wyzenbeek (30,000 double rubs for heavy wearing). You may also want to enquire about the fabrics score in light fastness (rating 1 - 8; 8 being no fading and 1 resulting in extensive fading). Reputable fabric supplies will have technical information readily available on their sampling. On the other hand leather is a durable hard wearing choice and an excellent option for allergy sufferers as dust doesn’t attract dust fibres as easily as it can for fabric. Also being a natural product, leather is breathable. There is more than one type of leather out there and not all leather is of the same quality, in fact “Calendared Leather” is not leather at all (it is a PVC)! With a range of terms like Corrected (buffed), Aniline (natural with no colour treatment), Pigmented (coated with colour), Semi-Aniline (dyed) it can be difficult to choose the leather that is right for you and your household. Some leathers age gracefully with natural patinas deepening over time (but are likely to scuff, stain from spills or oils from your skin), while others are very resistant to scratches, spills and keep a consistent look for many years. Really the choice between leather and fabric comes down to what you need your sofa to live up to; where is it positioned in the room… full sunlight? Who is using it… are they rough and tumble or careful? How frequently is it used? How long do I want this sofa for? Now you can start sitting in sofas and see which shape fits you and figure out your budget (topics for another day). Good luck!